NCEMCH faculty employ evidence-based methodologies based on a combination of established models of evidence-based public health learning to address these needs. Faculty use the Adapted Model: Quality Outcomes Based Education, Expanded Dreyfus Workforce Development Levels in all program activities. This model posits that successful outcome-based workforce development integrates (1) competency-based education, (2) adult learning theory, (3) an expanded Dreyfus model of the stages involved in the acquisition of public health skills, and (4) quality standards.4 The most effective workforce development and education programs operate within the intersection of these constructs.5 However, there remains a Zone of Proximal Development (ZPD),6 which is the gap between what learners can achieve on their own and what is possible with structured assistance. For successful learning to occur a scaffolding of supports needs to be present. 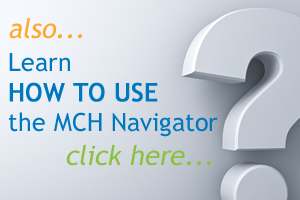 The MCH Navigator provides the content and supports to directly address learner needs within the overlap of these organizing principles, thus providing successful outcome-based workforce development that is guided, comprehensive, trusted, and curated. 1 Hunter EL. “Rebooting Our Boots on the Ground.” J Public Health M Practice (2015) 21(6 S): S1-S2. 2 Baker EL. “Addressing Urgent Public Health Workforce Needs: Building Informatics Capacity and Strengthening Management and Leadership Skills.” J Public Health M Practice (2015) 21(6 S): S5-S6. 3 Linde SR et al. “Health Resources and Services Administration Perspective on the Public Health Workforce Interests and Needs Survey.” J Pub Health M Practice (2015) 21(6S): S9-S10. 4 Wright K and Miner K. Adapted Model: Quality Outcomes Based Education, Expanded Dreyfus Workforce Development Levels, Public Health Workforce E-Learning Quality Standards Framework Project, de Beaumont Foundation 9/15/15. 5 Koo D, Miner K. “Outcome-Based Workforce Development and Education in Public Health.” Annu Rev Public Health (2009) 31:253-269. 6 Wikipedia. Zone of Proximal Development. Accessed 06/11/16.